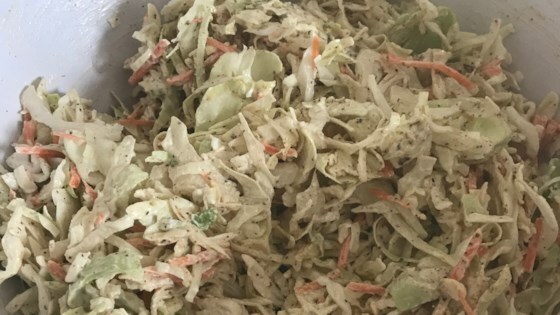 "Unique, sweet, creamy, and tangy coleslaw that compliments any BBQ. Serve smack dab on top of your favorite BBQ samiche or on the side." Stir cabbage and carrots together in a large bowl. Whisk creamy salad dressing, mayonnaise, buttermilk, sour cream, honey, apple cider vinegar, lemon juice, salt, basil pesto, mustard, cayenne pepper, celery seed, onion powder, ground black pepper, and garlic powder together in a bowl until smooth and creamy. Pour half the dressing over the cabbage mixture and toss to coat. Gradually add remainder of dressing until coleslaw is your desired consistency. Cover bowl with plastic wrap and refrigerate until flavors combine, at least 3 hours. This irresistible coleslaw is more tart and tangy than creamy. Reduced sour cream & mayo, no salad dressing, no butter milk and used Milwaukee Iron Seasoning in place of cayenne. I make it every Sunday. Turned out great but was really spicy (especially the next day). We will try it again but with much less cayenne.